Real fruit infused with the worlds best Complete Ocean Mineral Complex. This product is currently out of stock. Please check again shortly. 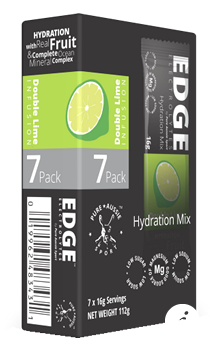 EDGE Electrolytes is the absolute latest in sports drinks and hydration products. It is through the use of real ingredients such as real fruit, innovative technology and plain old hard work that we have re-written the recipe book in sports hydration. In an industry breakthrough, we have replaced the use of sodium based compounds with cOMx™ Complete Ocean Minerals Complex which is Low Sodium, Rich in Magnesium and contains over 70 naturally occurring trace minerals. We use real fruit for that unbeatable taste and just a dash of cane sugar for energy. But the real secret behind EDGE is in the bioavailability of the electrolytes in our Complete Ocean Minerals Complex. This allows for easy absorption and rapid utilization of key electrolytes and trace minerals that your body needs to perform at its very best. 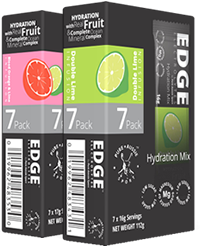 With only 12g sugar per 16 oz serving (prepared) EDGE Electrolytes is easy on the palate, gentle on the waistline and at the same time an incredibly versatile and efficient sports electrolyte. 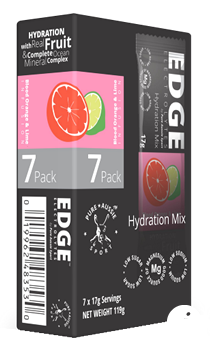 The true essence of Edge Electrolytes™ is not just in our authentic and refreshing flavor, but our complete ocean mineral complex for enhanced performance and recovery. Discover your EDGE!